You don’t have to wait until your multi-vari data are collected to start creating the multi-vari chart for Six Sigma. Instead, you can build the chart, incrementally, adding more to it as you collect more data. Multi-vari charts can be drawn by hand; in fact, the process operators themselves can create them, providing those folks with a critical opportunity to invest themselves in the discovery of the root cause and the development of the solution. A multi-vari chart looks pretty much like any other two-axis plot, with time moving from left to right on the horizontal axis and the measured process output metric plotted against the vertical axis. The multiple measurements of each unit are plotted together. Consecutive unit groupings move from left to right over time. A break in the horizontal progression of the chart indicates a temporal break in the process sampling. The multiple measurements taken on each unit are plotted as circles. A slightly modified circle designates the first, second, and third within-unit measurements. A solid line connects the multiple measurements within each unit and graphically indicates the magnitude of variation originating within each unit — the variation contribution from positional factors. An average point is plotted for each unit grouping. These unit averages are drawn as squares. If the multi-vari chart is drawn by hand, this average can be estimated. The average isn’t the center point between the maximum and minimum unit measurements; instead, think of it as the “balance point” between all the unit measurements. A long-dashed line is drawn connecting the averages of consecutive unit groupings measured. The up-and-down variation of this connecting line indicates the magnitude of variation between units, or the contribution of cyclical variation factors. A mark is plotted to show the overall average of the set of consecutive units measured. A short-dashed connecting line is drawn between the overall average points. The up-and-down variation of this connecting line indicates the magnitude of the variation between long breaks in time, or the contribution of temporal variation factors. Vertical lines are drawn along the horizontal axis to indicate the end of one temporal set of measurements and the beginning of the next. Each vertical divider embodies a relatively long duration of unmeasured process execution time. 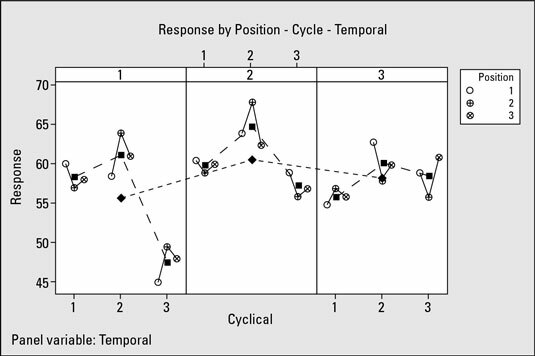 The sampling pattern repeats itself for three temporal occurrences. 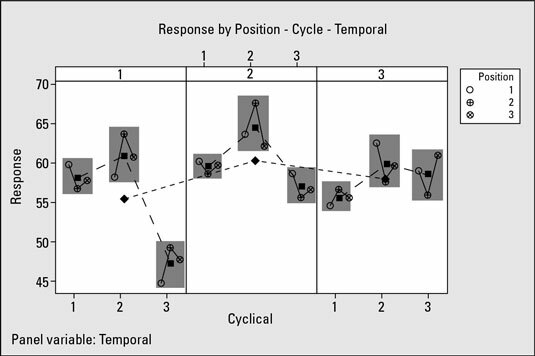 A typical multi-vari chart would continue for more temporal occurrences, always until enough process data are captured to match the historical levels of variation known to exist in the process. Each temporal occurrence contains the measurements of three consecutive units. Each cycle should contain at least three consecutive units, but up to five or six may be necessary. Each unit consists of three measurements of the same process characteristic. As with the temporal occurrences, having up to five or six measurements is sometimes useful. To determine which category of input variable drives the performance of your process output, all you have to do is graphically decide which of the three types of variation — positional, cyclical, or temporal — displays the greatest magnitude of variation in your multi-vari chart. You can compare the variation types by homing in on each one separately. The vertical range of the positional variation — indicated by the height of the gray boxes— graphically depicts the magnitude of the process variation stemming from positional input factors. The vertical range between the unit averages — indicated by the height of the gray boxes — graphically depicts the magnitude of variation coming from cyclical factors. 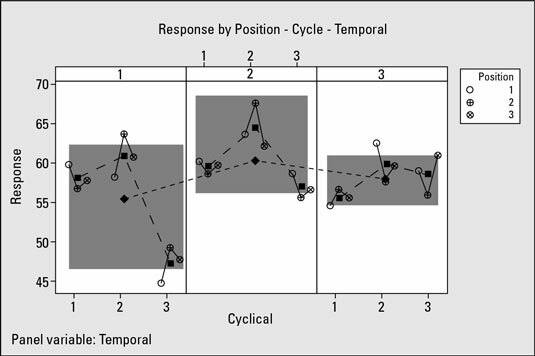 The vertical range between the temporal averages — shown again by the height of the gray box — graphically highlights the magnitude of the variation coming from temporal factors. Temporal factors are those that only change their input value across larger gaps of time but not within single units and not between consecutive units. 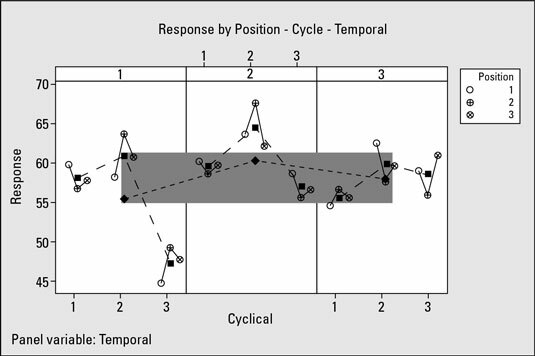 You can see that the vertical magnitude of the cyclical variation exceeds that for the positional or temporal categories. That result is the voice of the process telling you that the real root cause of your process performance is associated with some factor whose input value changes between production or creation of consecutive units. The multi-vari chart proves that all other factors that change input value within single units or change input value over longer times don’t exert a significant influence on the performance of the process.